Ro-Ro vessels with limited room for passengers. “Ro-pax” vessels replaced classic passenger and car ferries on many European lines. In 1994, the type B-501 vessels received the prestigious title of “Significant Ship of the Year” awarded by the British Royal Institution of Naval Architects to the most interesting and innovative new ships. It received the “1995 Export Junior” title at the 1995 Poznań International Fair. 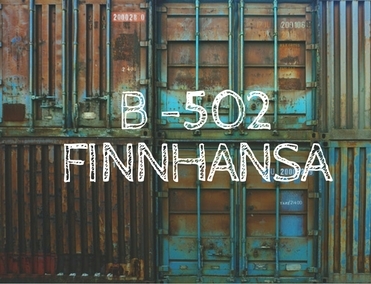 Four type B-501 vessels were built for a Finnish shipowner in 1991-1995. The idea to have the cargo roll on and off the ship is not new and dates back at least to the Middle Ages, when some ships were outfitted with ramps on which horse-driven wagons would roll off the ship onto the shore. This idea was further developed, through 19th century British railway ferries and 20th century Allied landing craft, which in the 1950s brought about the first oceangoing vessels outfitted with entrance ramps, internal ramps (deck to deck) and a ventilation system to remove exhaust fumes from the cargo area. A ship was loaded with the cargo being rolled on or the vehicles being driven in (roll on) and unloaded with the cargo being rolled off or the vehicles driven off (roll off), which is why these ships are commonly known as ro-ro vessels. The first ro-ro vessels in Poland were built in Gdańsk Shipyard. These were 10 type B-481 vessels built for the USSR in 1974-1986. In 1983, two of them (the Agostinio Neto and Nikolai Cherkasov) were tested as auxiliary aircraft carriers with Yak-38 vertical take-off and landing aircraft. The type B-481 vessels were scrapped in 2000-2011. The last ro-ro vessels built in Gdańsk Shipyard were four type B-501 ships ordered by the Finnish shipowner Finncarriers to sail from Helsinki to Lubeck. The keel was laid under the first of them in 1991. Named the Finnhansa, Finnpartner, Finntrader and Transeuropa, they were mainly to carry cargo (especially wheeled cargo), but the specific nature of the route required that there be room for passengers, which is why these vessels are known as “ro-pax” (for “ro-ro” and “passenger”). Some of the passenger cabins and all of the general access areas were designed for facilitated use by people with disabilities on wheelchairs. Short stays in port require a maximum reduction of the handling time: on type B-501 ships the replacement of the entire cargo takes only 12 hours, at 1800 tonnes per hour. The ships have a large refrigerated hold, where temperatures from +4oC to +14oC can be maintained. All four type B-501 vessels remain in operation as of 2016. The Shipyard was in serious trouble during the construction of these vessels: the deadline for the handover of the entire series to the shipowner had long lapsed and the first ship was still on the outfitting wharf. Materials were in short supply, as was the money needed to buy them; it seemed that the Shipyard would fail to meet the contract and have to pay damages, which would have meant the end of the company. The difficulties were overcome, but the very fact that they arose showed that the government and the financial institution failed to realise the scale of the problems faced by the shipbuilding industry.